It’s 6:00 in the morning. You’ve been waiting in the woods, freezing your hands off for hours with not so much as a twig breaking. Suddenly, you hear a rustle of leaves. You turn your head around to spot the buck you have been tracking for weeks. You slowly reach for your weapon. The buck makes his way in front of your stand. You are slowly reaching for your weapon when you bump your bag and scare the deer off, never to be seen again. Just like that, the buck of your dreams is gone. With the help of hunting straps, the story doesn’t have to end like that! Hunting straps from Ratchet Straps USA will change your hunting experience drastically! There are many different types of hunting straps that can be used in many different ways. 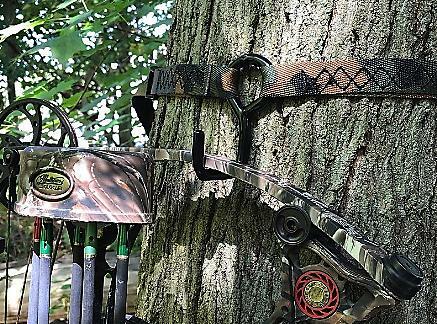 This article will discuss some of the well known and lesser known kinds of hunting straps and how to use them! If you have ever been hunting, you know the importance of quick access to all of your accessories and supplies. The last thing you want to be doing when you are out in the woods is digging through a bag for some kind of supplies. In many cases, those few moments of noise could be the difference in the outcome of the hunt. It would be a shame to let a fluke like that ruin your hunt! Most tree stands are relatively small, and clutter can become bothersome. There are certain things that you always want to have with you and when the size of your tree stand prevents you from bringing them, it becomes a problem Our One Inch CAMO Treestand accessory hook is a great way to get rid of tree stand clutter and free up space for the things you will need most on a hunt! One of the added bonuses of our tree stands accessory hook is the impressive 300-pound breaking strength it has. This number means that you will no longer have to leave out valuable items from your pack, and no more annoying tree stand clutter! Simply install the hook on a tree close to you or to the side of the tree your stand is mounted to and you are ready to go! The simple but effective design uses a one inch camouflage polyester strap that blends in easily with the environment. This polyester material also ensures that the strap causes no damage to the tree itself during installation. Another feature of our treestand accessory hook is the push to release cam buckle. This design allows you to quickly and easily install the accessory hook at the desired tightness, but also gives you the ability to release the tension with the press of a button! The one inch webbing also provides easy storage for use on the go while still providing durability and toughness! The straps come in three standard sizes: 7 foot, 9 foot, and 12 foot. While these are the only sizes available to order on the website, we have the ability to cut a strap to any length that you might need! Regardless of the size of the tree, we will do our best to give you the tools you need to be the most successful hunter you can be! Be sure to check out the video for a quick demonstration of the strength and capability of our tree stand accessory hook! Tree stands are a must have for any serious hunter. There is no getting around it. Most people take for granted how difficult it is to set up a tree stand, especially if you are by yourself. This process can be an extremely dangerous one and should not be taken lightly! If you are looking for a safe and reliable way to secure your stand to a tree without causing damage to the tree itself, look no further than Ratchet Straps USA huntings straps! Our One Inch CAMO Endless Ratchet Strap is the perfect multipurpose straps for hunting purposes! The design of the endless loop allows you to wrap the strap around anything without the need for a hook or attachment. Just simply loop the strap around whatever item you are trying to secure and feed the loose end back into the ratchet and you are ready to go! In this case, the item you will be securing is a tree stand. Our standard sizes range from 6-12 feet, but we are able to custom make a strap in any size to fit that tree that you just have to get a stand-in! The polyester construction of our one inch webbing provides for a rigid and durable feel that resists stretching, water, dirt, and other elements that could be harmful to the strap! The webbing has an impressive Working Load Limit of 833 pounds. The fact that your stand will likely have multiple straps holding it up is comforting because with these straps you can be confident in their ability to hold up under tough conditions! 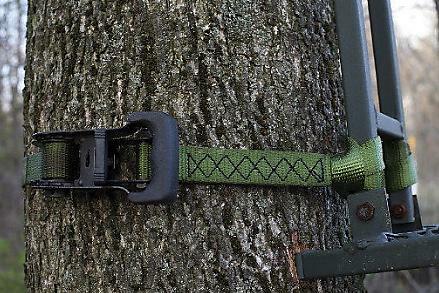 We make multiple varieties of hunting straps that could be used practically when it comes to tree stands. Our endless loop straps can be used to secure the stand to the tree. Ratchets straps with S-hooks can be used to safely bring gear and other supplies up the ladder to reduce climbing related injuries. And as mentioned in the paragraph above, they can be used as an efficient storage device! Where can I buy Hunting Straps? Ratchet Straps USA has an amazing selection of quality, affordable hunting straps to improve the way you hunt! If you have any questions about how you can make your hunting experience better with our hunting straps, one of our expert customer service representatives would be happy to answer them for you! If you want to eliminate unnecessary safety risks and make the most out of your hunts, order some hunting straps of your own today! Give our Hunting Strap experts a call at 800-483-2189 and we would be glad to assist you further with finding the perfect hunting tie down for your application!